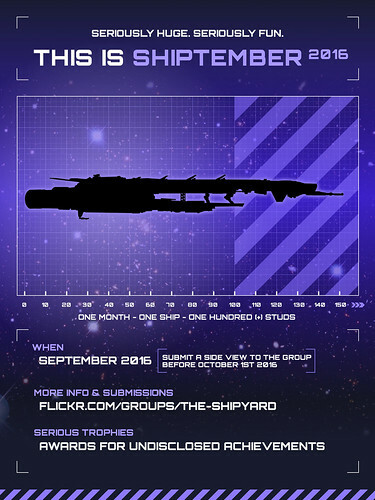 Rules: Build a SHIP must be 100 studs or longer between September 1st and October 1st. That's it! How do I enter? Simple! Start building your SHIP starting on Sept 1st, and start posting WIP shots as you go so everyone can all praise your guts for building a SHIP in a month! Pre-SHIPtember Rule! - Start Aug 1st! Since a good portion of people are going off to school in September or otherwise disposed, you can start August 1st, as long as you start posting in the WIP thread (this thread) you have one month (till September 1st) to finish. What scale should the SHIP be? It doesn't officially matter. Unofficially, Micro scale has been the rage last three year,s why not up the challenge with a Minifig scaled, and interior-ed SHIP? 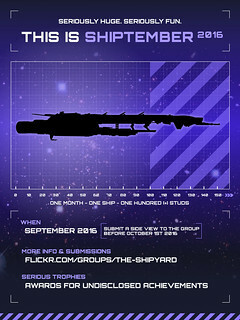 Please tag ALL photos with: "SHIPtember"